Anyone Else With This Stove Related Problem? We have an on-going dilemma with our 2-burner Atwood stove. Irene loves to cook using a larger square griddle like this one. Occasionally she will forget to use the larger grated burner with that griddle. The large griddle on the smaller grate over-hangs the plastic control panel decal and knobs. As a result, they have gotten damaged from the heat as seen below. Has anyone else experienced this? If so, did you find metal replacements for the damaged parts? If I do nothing, the knobs will eventually resemble black gum wads. Re: Anyone Else With This Stove Related Problem? First ? answer No. However I have broken some in my apartment or/and house years ago and I found a porcelain old one. As the spindles are very similar for different stoves, maybe an appliance manufacturer or repair shop has metal or porcelain replacements. 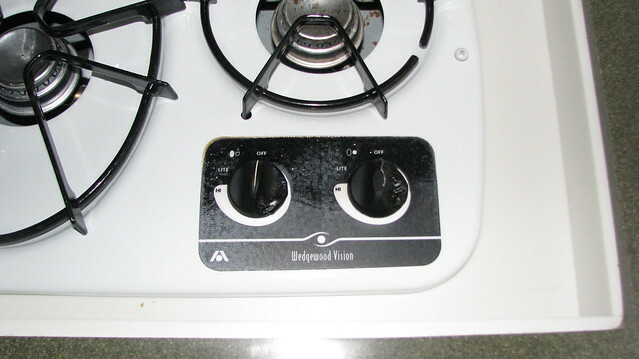 We have not (yet) melted the knobs but the flat decal has bubbled up on the top/rear edge (toward the small burner). We try to keep all the pans and the heat diffuser shifted back away from the knobs but we have not been totally successful on that. I don't have a solution. I just ordered a new label and a pair of knobs from a woman named Alex 937-526-2767 at JS Marketing. They take Paypal or credit card. I had ordered two sets for $40 but she could not fill the order because she just ran out of knobs so I bought her last 3 of the 4 I asked for, paying $34. I suppose you could back-order them. I am thinking of coming up with a heat shield to set in place to protect the knobs when Irene pulls out that big griddle. When we order our new PC I am thinking of specing this style stove. 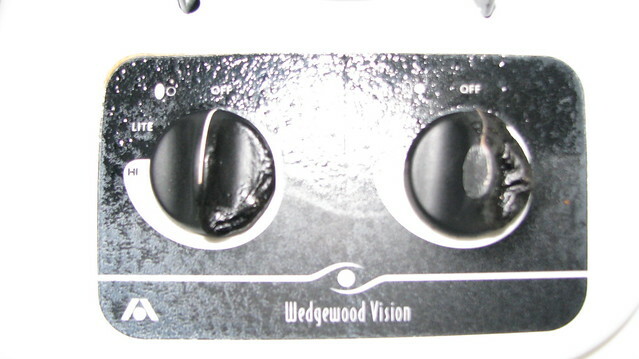 This should eliminate the burned knob problem. 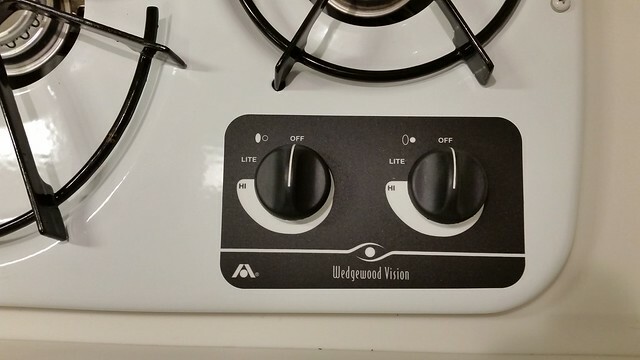 I finally got the stove knobs and backing replaced. I feel much better now. Now if I could just get my wife to remember to use the large left-side burner when cooking with the large griddle. Ron, the repair looks great!! The Phoenix stoves are inset so the matching counter covers can go over it. That is one of the awesome things everyone notices when they compare their rigs to ours. They are seriously jealous of our potential counter space. 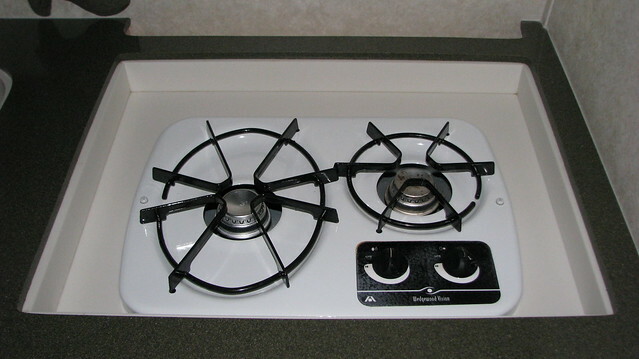 My suggestion is to make sure you would still be able to have the stove covers with the new configuration. Many rigs have metal caps that fold down over the stoves. The feedback I've had is the caps rattle, get in the way and are downright ugly. Our counter is gorgeous and multi-functional. We would never go the other way. I agree with 2 Frazzled. Adding: The stove with the knobs on the side as pictured, will negatively impact the size of the drawers in the base cabinet. As with everything else "RV" it is all about trade-offs, one for another. I personally would rather replace our knobs now and then to keep the counter top and base cabinet configuration we have today.